Steve Morton took such a great photo that I simply had to share. 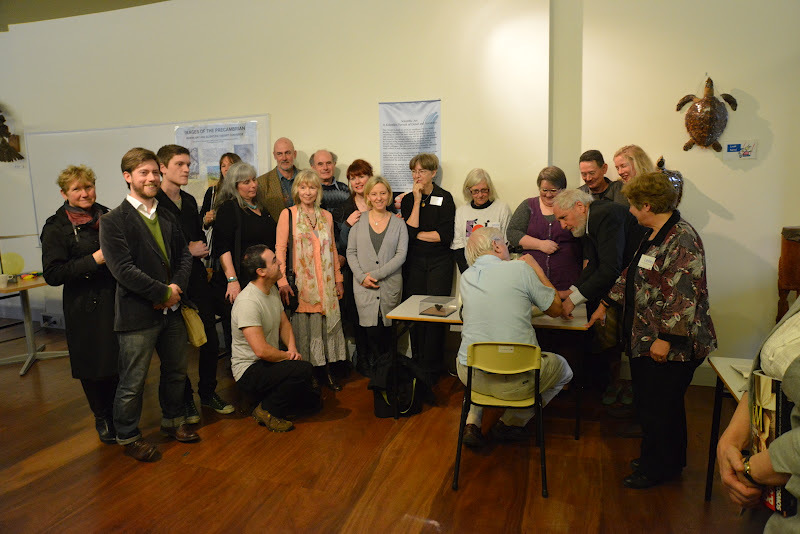 Here is Sir David Attenborough looking at our mammal jaw and surrounded by Dino Dreamers lucky enough to be invited to meet him at the Monash Science Centre. A big thanks to Prof Pat Vickers-Rich and Dr Corrie Willams for including me amongst them. ﻿ Sir David Attenborough is a patron of the Monash Science Centre and today paid a visit. A few lucky Dino Dreaming crew got to meet him. Melbourne Museum palaeontologist Dr Erich Fitzgerald has discovered that a strange 'coconut' shaped fossil is possibly the first fossil evidence of the family Neobalaenidae, a family of whales which contains just one extant species, the pygmy right whale (Capera marginata). Gippsland's Milk magazine has an article on our dinos and some incredibly cute cover art! Check it out at www.themilkmag.com. Hey Dino Diggers Past and Present! 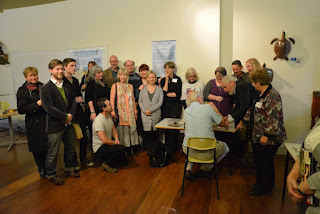 John is organising a get together on the afternoon of Saturday 25th August at the Monash Science Centre. Please get in touch with him (or me or Lesley) if you would like to come, and we'll give you all the details.